"It's hard to put into words exactly how special this place is to me!!! It was my dream wedding venue and the service exactly as magical!!! The grounds are beautifully maintained and the manor and rooms decorated so charmingly. Cathy and the staff are consistently so thoughtful, organized, caring, and I'm constantly impressed with their attention to detail and desire to serve! The day of my wedding, I didn’t have to worry about how things were going to be coordinated, and the day went absolutely perfectly! My husband & I even got to spend a night there a year or so after our wedding and we were greeted with the same amount of warmth as on our wedding day. Our professional acquaintance has turned to a special friendship!" 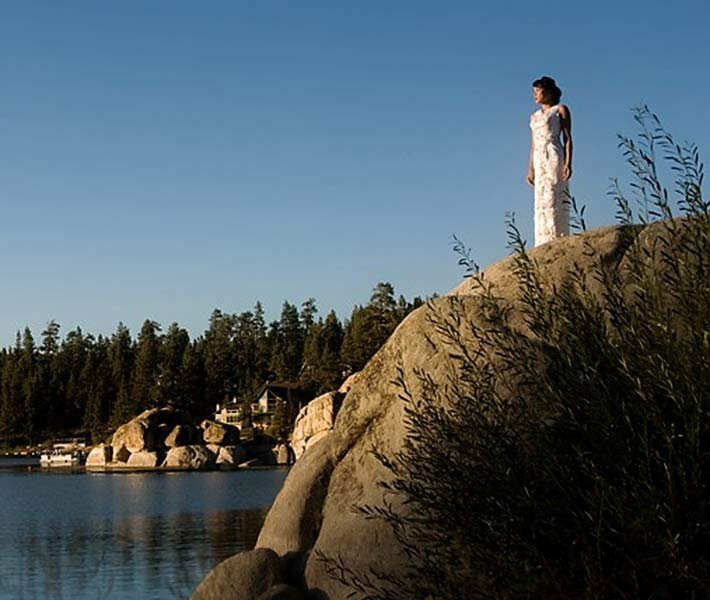 "I discovered GMM a few weeks ago when looking for an intimate wedding venue in Big Bear. I absolutely fell in love with this property! I've already made 2 trips to show different family members the venue and talk about wedding logistics. My favorite part is the lodge, there is nowhere else on the mountain where you can find such a great lodge! The rooms are so clean, personalized, spacious, and are decorated with such class. This is a BIG plus for brides/grooms who are looking to have family or close friends nearby for a few days around the ceremony. I guarantee everyone will love it! I'm so glad I came across this place, it’s not only a good location for a wedding venue but a place I can definitely see me coming back for a weekend get-a-away with family or friends." "So I'd like to thank Mother Nature and Big Bear for a fantastic weekend! My daughter got married up here on the 5th @ Gold Mountain Manor and it was PERFECT! The whole staff did a great job handling every detail and working with all the catering people my daughter hired. We had wind, rain, thunder, lighting, and TWO earthquakes and still no one had any issues, and I would like to know how they pulled off the earth quakes, LOL. the wedding went off without a hitch even with road closures and all. The total experience was so awesome my daughter and son in law will have great memories of their wedding day and a lot to laugh about as they recount their day on their anniversary over the many years to come. I would personally like to thank Kathy and her staff at Gold Mountain Manor for the experience and recommend if you ever want to stay at a Bed and Breakfast or need a place to hold a wedding this is it." "How perfect! I spent my first night, December 26th, at Gold Mountain Manor by myself in the Ted Ducey Suite. My fiancé Fred and our 7 children slept in various other rooms in the Manor. The next night, December 27th, I did not sleep in the Ted Ducey room alone but with my new husband after getting married in front of the large fireplace right upstairs! It was an absolutely perfect wedding with views of the icicles and a carpet of white snow glistening in the clear blue sunshine, just as our rings glisten on our fingers now! What a dream come true! Thank you Gold Mountain Manor!" "Today I get to marry the man of my dreams. This whole experience at Gold Mountain Manor has been so wonderful. This place is a dream and the perfect place to host our rustic, elegant wedding. The Staff here are terrific and so accommodating. I couldn’t have chosen a better venue. Thank you Cathy for letting me bring my bunnies and doggie to share this day with me. My guests will never forget this place and how wonderful our wedding was." "Our wedding day finally came! We couldn’t have picked a more special place and everyone agreed! Not once did we need to worry about the planning and organization as it was taken care of. We simply were able to enjoy the day. Thank you Cathy, Linda, Scott and all the Gold Mountain Manor Staff for what you did for us. We are forever thankful." "We are getting married today!! This has been a long journey: 10 yrs. together, 3 years engaged. Our entourage of family and friends are here from far off lands. We found Gold Mountain Manor, which has been the perfect place to celebrate. We are here, marriage license in hand (stood in line on Monday right after the Supreme Court decision on Prop. 8) and reflecting on everything that brought us here. I couldn’t be happier!!" "The Gold Mountain Manor was the best. we couldn't have found a more perfect place to exchange our vows, our reception was outside in the beautiful garden and the weather was absolutely perfect it was very special to us we felt God shining down on us and the lighting we got for the pictures was absolutely breath taking . The best part was that we rented the whole place to ourselves for only 4500 dollars. And that was for 2 days so we got a relaxed environment, we weren’t rushed in anything, and we had rooms for our guests to stay in not to mention the rooms were fabulous... I could go on and on about it, it was just absolutely perfect everything I had ever hoped and dreamed for... I would recommend this place to anyone who is looking to have a wonderful stress free wedding.... Kathy by the way referred me to my wonderful photographer Louis Weiner and Caterer Denise Cavali, which by the way went the extra mile in providing votive candles and tulle that matched my cake beautifully. And the food was exquisite. I am forever grateful for everyone that helped in my wedding I wouldn't have known what to do without them they are wonderful..."
"I am a DJ so I am reviewing this location as a vendor. I was hired to DJ a wedding here on August 9th. It was one of my favorite jobs I have done in several years. The location was beautiful, the staff was extremely friendly and accommodating. My set up was very simple. I was able to park my car about 15 feet from where I was going to set up so it made my load in very quickly and easy. (Then I moved my car to the street). I know this is going to be a weird comment but even the bathrooms were clean. If you are getting married in the Big Bear area. You need to give Gold Mountain Manor a look. I think you will be very happy."